Welcome to our pages of European Arms and Armour. Our armour has been designed to suit the needs of collectors, period re-enactors/living history groups as well as other re-enactment societies. Each piece of armour is individually hand crafted by some of the best plattner's in Europe. They are able to study in depth original pieces from museums and private collections in Europe. Old-World craftsmanship ensures attention to detail. The bowls are dished with hammers not pressed by machines. The armour is true to the originals and is professionally made, using a minimum of modern processes. The armour can be constructed to your preference of 14, 16 or 18-gauge steel. The armor can custom made to your measurements or choose standard off the rack armour. Each piece of armor is fully functional. This armour can be used for either Display or for SCA, Live Steel and Stage Fighting! Whether you desire museum quality display pieces or battle ready jousting armour we feel confident you can find it here. 13th Century Great Helm from 16 gauge steel. Adorned with brass cross. Blackened inside is lined with adjustable suspension leather liner. A leather chin strap with an antiqued brass buckle finishes the helmet. 13th Century Great Helm from 16 gauge steel. Adorned with brass cross and crown. Blackened inside is lined with adjustable suspension liner of quilted and padded cotton. A leather chin strap with an antiqued brass buckle finishes the helmet. Dating from the 15th century, the Medieval Barbuta shows a strong resemblance to much older Corinthian helms. Originating in Italy, the Barbuta saw widespread use throughout Europe. The 15th Century Domed Kettle Hat is constructed from 16 gauge steel. The blackened interior has an adjustable leather suspension liner. The helmet is finished with an adjustable leather chin strap and brass buckle. The 14th Century Conical Kettle Hat is constructed from 16 gauge steel. The blackened interior has an adjustable leather suspension liner. The helmet is finished with an adjustable leather chin strap and brass buckle. Our Functional Corinthian Style Barbuta is made from 16 gauge steel and is available with a standard 23 ½" head circumference. The Archers Sallet was popular with medieval foot soldiers as well as archers and is made from 18 gauge steel. Available with a standard 23 ½" head circumference. This museum quality German Sallet Fixed Tail Medieval Helmet is re-enactment ready and made from your choice of 1.8mm, 1.5mm or 2mm thick steel. Standard 23 ½ inch head circumference. This German Sallet Helm of the 15th Century features a fully movable visor which locks with a spring pin. The neck guard is fully articulated with two lames and the edges are rolled and roped. Polished finish. The German Sallet Helm of the 15th Century came in a wide variety of shapes and form. Usually worn with a bevor, this functional helm circa 1490, features a fully movable visor which locks with a spring pin. The Celesta Helmet is also known as Sallet or Archer's Helm. It was worn primarily in the 15th century in Central Europe. 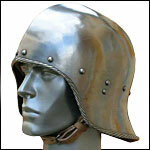 This Functional Medieval Barbute Helmet is hand forged and comes with your choice of steel thicknesses. The flared edges help to direct any blows away from the helmet. This is a fine example of a transitional form of the medieval Sallet helm before the introduction of the Armet helmet. This 15th century Barbuta is made from 18 gauge steel and is available with a standard 23 ½" head circumference. Our Functional Sallet Helm with Tall Visor and Articulated Tail is made from 16 gauge steel and is available with a standard 23 ½" head circumference. This quality 15th Century Medieval Kettle Hat with Oculars (eye slits) is made from 1.5mm steel and is available with a standard 23 ½ in head circumference. Includes padding and chin strap. The Open Face German Sallet is an excellent reproduction 15th century helmet and can be used for re-enactment or display. If you are not planning to use padding in the helm, an optional leather suspension liner is available. The Leather Covered Medieval Barbute Helmet is fully functional and comes with your choice of steel thicknesses. During the middle ages much of plate armor was covered in cloth, leather or painted to help prevent rust. Medieval Armor Crown Steel or Brass and is suitable for SCA, LARP or Cosplay. This medieval crown is not a delicate costume piece. Can be worn over your medieval helmet, chain mail coif, arming cap or on its own. Milanese Armet - Early 15th Century - Functional. Includes hinged locking side plates, and moveable visor. This custom made helmet has a choice of steel thickness, standard or custom sizes and internal padding options. This is a fine example of a medieval Frog Mouth Jousting Helmet. This version has a fluted skull with breaths (air holes) and leather straps for attaching to a breastplate. The helmet is angled in the front to deflect lance blows.